For the American soccer player, see Mike Nugent (soccer). For the Australian Paralympic athlete, see Mike Nugent (athlete). Michael Nugent (born March 2, 1982) is an American football placekicker who is currently a free agent. He played college football for Ohio State University, and was twice recognized as a consensus All-American. He was drafted by the New York Jets in the second round of the 2005 NFL Draft, and has also played for the Tampa Bay Buccaneers, Arizona Cardinals, Cincinnati Bengals, Dallas Cowboys, and Chicago Bears. Nugent was born in Centerville, Ohio. He attended Centerville High School, and played kicker and quarterback on the Elks football team. He was a teammate of linebacker A. J. Hawk on the school's football team. As a senior kicker, he converted on five out of seven field goal attempts of greater than fifty yards (24 of 27 altogether), kicked a 55-yard field goal twice, and was 29 out of 29 extra point attempts. While attending Ohio State University, Nugent played for coach Jim Tressel's Ohio State Buckeyes football team from 2001 to 2004. During his four-year career at Ohio State, he broke or tied 22 school records, including most points in a career by any player at Ohio State (356). He completed 72 of 88 field goal attempts and 140 of 143 extra point attempts. He was recognized as a consensus first-team All-American as a sophomore in 2002 and again as a unanimous All-American senior in 2004, and received the Lou Groza Award as the nation's top college placekicker in 2004. He also was part of the 2002 Ohio State Buckeyes Division I National Championship team. He became the first kicker in school history to earn team most valuable player honors. Nugent was selected by the New York Jets in the second round (47th overall) of the 2005 NFL Draft. During the opening game of the 2008 NFL season, Nugent injured his quadriceps following an extra point. To replace Nugent the Jets signed Jay Feely, who performed so well in the position that he became the Jets' starter while Nugent, who eventually recovered from his injury, was forced to stay on the bench. As an unrestricted free agent in the 2009 offseason, Nugent signed a one-year contract with the Tampa Bay Buccaneers on March 4 and won the job over Matt Bryant in the preseason due to Bryant's injury. After converting just two of his first six tries (2 blocked) through four games, Nugent was released by the Buccaneers on October 5. Nugent signed with the Arizona Cardinals on December 16, 2009 as a temporary replacement for the injured Neil Rackers. He was waived by the Cardinals on January 2, 2010. Nugent signed with the Cincinnati Bengals on April 23, 2010. He competed with Dave Rayner throughout training camp and the preseason for the Bengals starting job. Nugent eventually won the competition when the Bengals released Rayner on September 4, 2010, after Nugent made 54- and 52-yard field goals in the team's final two preseason games. Nugent was named the AFC Special Teams Player of the Month for the month of September by going 8 for 8 on field goal tries in the Bengals' first three games of the season. In 2011, Nugent set franchise records for points (132) and field goals (33). He signed a one-year contract tender with the Bengals for the 2012 season, and on March 10, 2013, the Bengals re-signed Nugent to a two-year deal. On September 7, 2014, Nugent tied the NFL record for most field goals made in one half with 5. On January 4, 2015, Nugent kicked a career-long 58-yard field goal during the AFC first-round playoff game against the Indianapolis Colts. On October 11, 2015, Nugent made a winning field goal against the Seattle Seahawks in overtime in Week 5, 2015. Nugent was released by the Bengals on December 13, 2016 after missing five PAT attempts in five games. On August 1, 2017, Nugent signed with the New York Giants where he would compete with Aldrick Rosas for the starting position. At the conclusion of the preseason, Nugent was cut from the Giants' roster on September 2, 2017. On October 24, 2017, Nugent was signed by the Dallas Cowboys as a stand-in for injured Dan Bailey, reuniting with Rich Bisaccia who was his special teams coach with the Tampa Bay Buccaneers. He was released on November 26, after Bailey was deemed healthy from his previous groin injury. He made 7 out of 9 field goals in four games. On December 4, 2017, the Chicago Bears signed Nugent to replace the injured Cairo Santos. In Week 17, Nugent tied his personal record when he converted a 55-yard field goal. On August 4, 2018, Nugent signed with the Oakland Raiders. He was placed on injured reserve on September 26, 2018 after suffering a hip injury in Week 3. ^ 2011 NCAA Football Records Book, Award Winners, National Collegiate Athletic Association, Indianapolis, Indiana, p. 11 (2011). Retrieved June 22, 2012. ^ "Previous Winners". Lou Groza Collegiate Place-Kicker Award. Retrieved December 19, 2016. ^ "Nugent Named Buckeyes' Most Valuable Player". www.ohiostatebuckeyes.com. The Ohio State University. Retrieved December 19, 2016. ^ "Mike Nugent College Stats". Sports-Reference.com. Retrieved December 19, 2016. ^ "Cards cut Nugent, add Banks". January 2, 2010. Retrieved December 13, 2016. ^ "Sunday's moves: Bengals re-sign Mike Nugent; Redskins keep snapper". ^ Hobson, Geoff (December 13, 2016). "Bengals move from Nugent, claim Bullock". Retrieved December 13, 2016. ^ Eisen, Michael (August 1, 2017). "Giants sign veteran kicker Mike Nugent". Giants.com. ^ Eisen, Michael (September 2, 2017). "New York Giants announce 2017 53-man roster". Giants.com. Archived from the original on December 5, 2017. Retrieved September 5, 2017. ^ Helman, David (October 24, 2017). 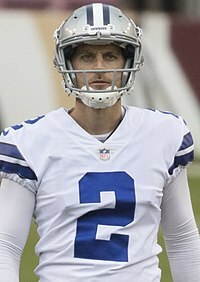 "Cowboys Add Veteran Kicker Mike Nugent, Release DE Damontre' Moore". DallasCowboys.com. ^ Phillips, Rob (November 26, 2017). "Cowboys Release McFadden, Nugent; Sign Pass Rusher, Promote RB To Roster". DallasCowboys.com. ^ Mayer, Larry (December 4, 2017). "Nugent replaces injured Santos as Bears kicker". ChicagoBears.com. Retrieved December 5, 2017. ^ "Raiders sign kicker Mike Nugent; waive kicker Giorgio Tavecchio". Raiders.com. August 4, 2018. ^ "Raiders Sign K Matt McCrane; Place K Mike Nugent on IR". Raiders.com. September 26, 2018. ^ "Mike Nugent". National Football League. Retrieved December 19, 2016. Wikimedia Commons has media related to Mike Nugent.